With thawing temperatures this week, I'm starting to get excited about spring and Easter. Kaboom! Entertainment has us covered with the perfect DVDs to celebrate the slow arrival of slightly warmer weather! Zack (a dynamic boy) & Quack (an impulsive young duck) live inside the most amazing pop-up book ever! It's a place full of fantastical surprises – where pulling pop-ups makes exciting and unexpected things happen. Hannah loves books, especially pop-ups, so it was wonderful to watch her watch show that takes place within one. As someone who suffers hiccups on a regular basis, Hannah enjoyed watching the episode "Popping Hopping Hiccups". Belly Up, a frog with an amazing accent, spends the episode trying different ways to loose his hiccups as the gang jumps through several pages. Zack & Quack Popping Hopping Easter includes 5 episodes that run 11 minutes each. It's the first time Zack & Quack are on DVD in Canada! Another great Easter gift is Guess How Much I Love You - Someone Special. A DVD with stories featuring a bunny is quite fitting! The Treehouse Ultimate Collection Cube contains 10 DVDs, which results in over 10 hours of educational fun. DVDs include some of the most popular Treehouse friends including Toopy, Binoo, Franklin, Max, Ruby, Brother Bear, Captain Barnacles, Kwazii, Golias and Nessa. We don't have cable. We have Netflix and many, many DVDs. Hannah gets to watch Treehouse when she's over at Grandma's. Last year the Big Show was My Big Big Friend, but this year she LOVES Octonauts. Chris filmed Hannah opening the Treehouse Ultimate Collection Cube - check out her reactions in the unboxing video below. Make sure to like the Kaboom! Entertainment Facebook page and follow them on Twitter to learn about upcoming releases. One lucky YYZ Bambina reader will win the Treehouse Ultimate Collection Cube AND Zack & Quack Hopping Easter. Make sure to enter by March 27th, 2015. Disclosure: I received copies of the DVDs for the purpose of this review. As always, opinions on my blog are my own. My Son loves Franklin the Turtle! My kids loves Max and Ruby. My little guys like Toopy and Binoo! We love Max & Ruby in our house! 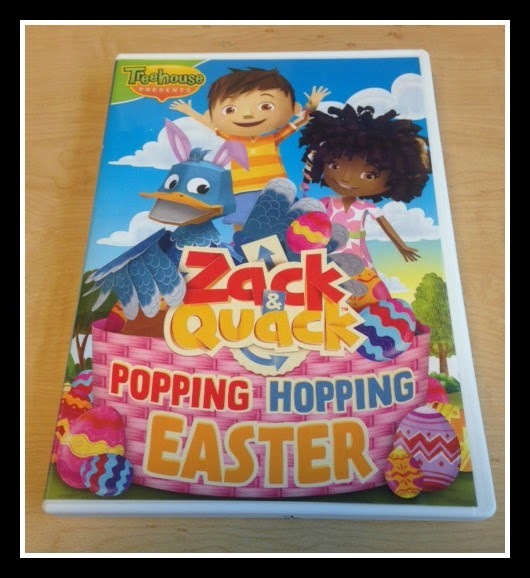 and Zack & Quack:Popping Hopping Easter DVD. Who is your favourite friend from the Treehouse Ultimate Collection Cube? I like Max & Ruby. Franklin is the favorite here. I really like Franklin. Toopy and Binoo are my sons favourites!! Toopy and Binoo are my grandkids favorite. Toopy and Binoo are a favourite! Toopy and Binoo for us! It's a toss up between Max & Ruby & Toopy and Binoo for our daughter. My kids love max and ruby. The Berenstain Bears are our favourite friends from the collection. Toopy and Binoo is our favorite.